On August 29th 2007, the great man watched as the wraps came off his statue in Parliament Square. Fleetingly I thought of other statues of leaders. How size certainly does matter. How art and politics can not be kept apart, any more than sport and politics could be kept apart in an earlier South Africa. How the downing of statues can be as symbolic an act as their erections. He already is an awesome world-figure, destined for his place in the history of the 20th Century. There may well be revisions to the story. There always are. Human-scaled blemishes will be revealed to enrich the tale of his role in the struggle of his country on what he termed a long walk to freedom. Enriched by evidence of weakness, temptations yielded to … Otherwise, the deification process will have succeeded in eliminating the personality behind the icon. I was immensely moved by Mandela’s story written down in his autobiography. I go back to it from time to time. I remain in awe of what he communicated about his time in prison. ‘Even in the grimmest times … I would see a glimmer of humanity in one of the guards, perhaps just for a second, but that was enough to reassure me and keep me going. Man’s goodness is a flame that can be hidden but never extinguished’. With Mandela, the process is reversed. In his every public action his ‘goodness’ shines through. We search for that second of wilfulness and vengefulness that seems forever hidden. For from diminishing his achievements, I feel this will enrich them by connecting them more strongly to the wider human world of weakness and frailty to self-service. The idea of the great charismatic leader is coming increasingly under scrutiny. Leadership scholars have largely discarded earlier ideas of the heroic leader, or at very least challenged them. In the 1980s, a tamed-down version of charisma was proposed, as the transformational leader. More recently, the expression post-charismatic leader has emerged, from theological and secular sources. In this context, Nelson Mandela and his story deserves the closest attention. He may be the exceptional case which tests a wider concept. Classical leadership theory would suggest that the course of history was fundamentally influenced by the actions of the great leader. Did the charismatic leader make a difference? The more you dig, the more complexities emerge. Whether you read to challenge the idea of the great leader, or to challenge it, read for yourself. Today’s story of the tribute in Parliament Square is more of an ironic tale. One version might run as follows. 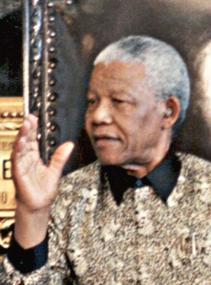 The idea of erecting a statue to Nelson Mandela has been around for over a decade. There was (and still is) a highly suitable place in Trafalgar Square, which has four plinths for monumental pieces. Three are occupied with military and monarchic figures. The fourth would be particularly appropriate as it is close to the South Africa House, focus of so many ‘Free Nelson Mandela’ demos during his imprisonment on Robben Island. When the public was invited to suggest appropriate images, For some while, a favored image was of a piece which would celebrate animals in wartime service. Nelson Mandela was among other front runners together with The Queen, Margaret Thatcher, Lady Diana, as well as long shots such as David Beckham, Winnie the Pooh, and a very large Pidgeon, (capturing one of the more intrusive visiting groups that flock to Trafalgar Square). The fund-raising ran ahead of the official decision, and the statute commissioned was considered too massive for the original location. Eventually the political pieces fell into place, and Nelson Mandela’s image was unveiled at Parliament Square, rather than close by to that other Nelson atop his column in Trafalgar Square. Trust the poets to have something interesting to say. Anyone with a taste for such things will find something in Shelley’s words I borrowed above. Margaret Hodge: A good time to resign? Resignation from public office is an extreme leadership decision. It can make or mar a career. But resigning is not necessarily a forced move. Margaret Hodge may find it an option worth considering. Margaret Hodge has taken a high-profile position over immigration. So high-profile and dangerous that I am inclined to fall back on one of my favorite metaphors – chess as a source of leadership insights. Margaret is in a tricky position, so she weighs up the possibilities, and makes a dangerous move in an attempt to break free. In chess terms, it’s a forced move. Or no-brainer. In chess, faced with a forced move, a player will sometimes stare at the board, wasting valuable time, looking for another playable move. This is mostly futile. It’s better to make the move and take the consequences, or resign and take the consequences of that. Even in chess, there may be an overlooked possibility. Training books have examples of positions in which a player has resigned, failing to see an unexpected move. The forced moves believed to lead to certain defeat were not forced after all. So let’s look at the salient features of the position Margaret Hodge finds herself in. The problems appear to be to do with social housing, the British term for state-provided housing, traditionally controlled by local councils, hence ‘council estates’. But council estates impact on national politics. More than 1.5m homes have been sold off since the Conservative government introduced “right to buy” legislation in the 1980s. The Treasury-sponsored Barker report said in 2004 that Britain needs to build 140,000 new homes a year – of which 23,000 should be social housing units – if housing supply is to meet demand. The Lib Dems say there are 1.6m families on waiting lists for social housing – compared to 1m in 1997. It is hardly surprising if Margaret Hodge has drawn attention to the issue. As a Minister of State she has chosen to make broaden the debate. Margaret Hodge is wrong. Far from it being the case that immigrants are jumping the housing queue, the opposite is true, with immigrants naturally finding it very much harder to find their way round a system with which they are not familiar … Instead of making remarks which will be seen as scapegoating immigrants, senior politicians like Margaret Hodge should be working to solve the real housing shortage affecting all communities. [Her] suggestion that housing allocation should be based not on need but factors like length of residence would be catastrophic for community relations. In reality it would quite rightly be illegal to take immigration status into account in allocating housing. Even in chess, there are good times to resign. A strong player has some social obligation to ‘go over the game’ afterwards showing where his defeated opponent went wrong. This encourages an early resignation. It’s part of the learning and maturing process for juniors, who tend to prolong the agony rather than capitulate. So, I’m suggesting that resignation is anything but a no-brainer for Margaret Hodge. If she is right, she is under increasing threat of losing her parliamentary seat. Her own stated estimate is that 80% of white families in her constituency were tempted by the British National Party. At the recent local elections the BNP won 11 of the 13 seats it contested in Barking and Dagenham, making it the second party. The unexpected move in the wider game would have been resignation from her ministerial duties, so that she could fight more directly for the interests of her constituents. Such actions have more credibility if the leader clearly is prepared to suffer personal damage for the wider cause. Realistically such a move would have made more sense before she stood for the current election for deputy leadership of the Party. This is unlikely to happen. I offer it as a thought experiment of possibilities for leadership rather than as a prediction. … in politics and boxing. What leadership lessons can be learned from the narrow victories of Nicholas Sarcozy in France, Alex Salmond in Scotland, David Cameron in England, and Floyd Mayweather in Las Vagas? This week in France, the biggest contest of the year to date came to a close but predicted conclusion with victory to Nicholas Sarcozy. This requires a closer examination in its own right, elsewhere. Sarco-Sega round two has inevitably been bigger than Sarco-Sega round one. Its own prime-time TV blockbuster attracted an audience of over 20 million viewers. In Britain, there were elections in Wales for its National Assembly, In Scotland for its Parliament, and in England at local Council level. All had their points of interest from a leadership perspective. A clear, yet uneasy triumph for Sarcozy, with 53% to 47% of an awesome 85% turnout. The uncertainties among the electorate were not translated into a low vote. The uneasiness was confirmed in demonstrations by his bitterest opponents, although these were assessed as minor by the standards of the nation’s tradition of action direct. Sarcozy’s earliest remarks after his victory indicated his wish to serve all the French people. (Echoes of Margaret Thatcher’s debut utterance on taking power, from the steps of Number 10 Downing Street?). There is no English parliament, per se, and so there are never English National elections. In England, The local council elections have been taken as an indicator of the wider political struggles. For months, the (United Kingdon) Government had been acknowledging the inevitability of significant loss of support, reflected in the outcome at the local elections. This painful admission was, at least, one which could hardly be attacked by their opponents. The ultimate meltdown which was hinted at in the run-up did not take place. The departure of Tony Blair as PM, (now anticipated to be more a matter of days rather than months), will be an opportunity for the party to distance the party and its new leader from the unpopularity of Mr. Blair, now particularly damaged for his identification as an architect of the Iraq war and its consequences. The new composition of the Welsh National Assembly shows how a sizable proportion of voters in the Principality have, at least temporarily, found a new political favorite. Wales has always been suspicious of Socialist-lite Labour, and has never been enthusiastic for the new-fangled Blairite version. This week, voters even deserted Old labour in favour of the nationalism of The Plaid. (Plaid Cymru, The Party of Wales). The results disrupted the stranglehold exercised by the Socialists. And the De La Hoya/Mayweather contest? This contest also offers insight on leadership. At one level we are aware of how boxing fits well with the metaphor of leadership as a form of warfare. The most recent example was Mr Blair’s outburst about the clunking big fist which would smite the opponents of the Labour Party in the near future. 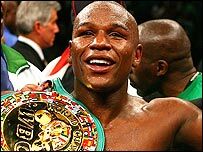 The De La Hoya/Mayweather contest was an example of a battle between combatants of differing strengths and weaknesses. De La Hoya, aging, but physically more powerful De La Hoya. In contrast, Mayweather was younger, swifter, technically outstanding. Game theorists would be able to examine the uncertainties within a predictable pattern of behaviors. De La Hoya tried to deliver a ‘clunking big fist’. To do so, he had to withstand the elusive moves, and energy-sapping if lighter blows of his opponent. Which was partly why the contest was so fascinating. Mayweather won. But De La Hoya was always going to win another battle, through another piece of the action, as major investor in Golden Boy promotions, the company which had put on the fight. Leadership lessons of the week? What a week. Leaders in action, winning and losing, but often able to claim wriggle room to fight again. For the most part, the lessons seem to show that the political leaders were instruments, symbols, which helped ‘followers’, particularly voters, to show their allegiance. The symbols were the primary focus of decision-making. We are learning of the role of atavars, or constructed identities, in webworlds. Are these really so less ‘real’ than the constructed images of our political leaders. Do they shape our judgement of their policies? Or is the ‘direction of causality’ more from our prior social beliefs and values to our interpretation of the worth of the individual leaders? Which brings us back to the idea of how we create the leaders we deserve. You are currently browsing the archives for the Margaret Thatcher category.